Is this a question you’ve ever asked when you see a string of letters that pretty clearly refers to an organization of some kind? When you can’t tell from the context what KIND of organization? A lodge? A religious group? A self-insurance plan? A political party? A company? A governmental department? Even a railroad? If you’ve asked that question, you’ve got company. Acronyms, initialisms, and abbreviations for organizations have been around ever since the Roman legions walked around with “SPQR” on poles (that was an initialism for Senatus Populesque Romanus, by the way). We’ve asked that question over and over for a long time, and we decided to do something about it. 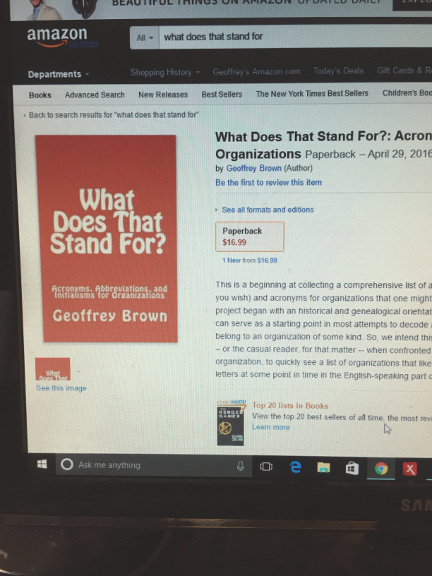 We wrote a book — 318 pages, mostly an alphabetical listing of abbreviations, acronyms, and initialisms for organizations of all kinds. Now we’ve published it, and you can see it on Amazon.com. (Of course, if you’re so inclined — and we hope that you are — you can also buy it there!). So, CLICK HERE to see it on Amazon. You might just decide that it really fills a need.